Registration gate opens at 8:00 am and closes at 10:00 am. Event registration is limited to 150 vehicles. First Place and Outstanding Trophies in all classes. The T-Shirts will be included in the Registration Package. Participants using PayPal can register now or mail in their registration forms in advance and pay $25.00 using the form below. (We will charge $35.00 to those people that arrive on Saturday at the Show and have not prepaid.) Preregistration closes 2 days before the Show. All sales are final, we will have the Show rain or shine! Stock: up to 2 modifications, Modified: 3 modifications - wheels, engine coves, minor interior changes, Custom: 4 or more major modifications - resto mod, rad doors, custom paint, body panels. 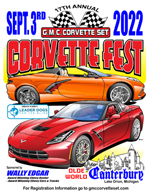 Corvette Fest t-shirts are available to order in advance. Add show t-shirts to this registration. Corvette Fest T-Shirts are printed using a 'direct to garment' process for top quality, that results in a redyeing of the fabric as opposed to ink or other material on top of the fabric. 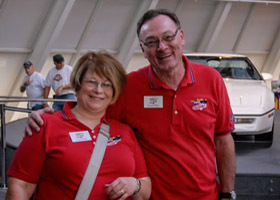 The GMC Corvette Set will deliver the T-shirts to the Show participants as part of the their registration package. If you miss the Show, contact the Show Chair to arrange a place and time to pick up your T-Shirt(s). When I register a Corvette for Corvette Fest I accept full liability for any injury or loss to me or my property, agents or employees at any time and from any cause on the premises of the Show. I expressly release the management from any liability for such loss or injury and agree to pay for my own insurance. The G.M.C. Corvette Set Inc., Canterbury Village and other Show sponsors assume no responsibility for injury to me or my property at the 'Canterbury Corvette Fest'. I accept the above terms and want to register for the Corvette Fest. The cost is $35.00 the day of the Show or you can preregister for $25.00 (T-shirts extra). Forms which include shirt orders must be received by June 06, 2019. Registration form orders must be received by June 12, 2019. Step 1: Step 2:Mail in your completed form and check to the address on the print-out. I accept the Show terms as outlined above.